Australia is the pearl of the southern hemisphere. Land of contrasts, Australia is famous for its natural wonders and great desert spaces, however, Australia is actually one of the most urbanized countries in the world, with large cosmopolitan cities such as Melbourne, Brisbane, Sydney and Perth. Melbourne's second largest city, Melbourne is a great commercial and cultural center, it is considered the most European city in Australia. Perth a city located just to the southwest of Australia. Sydney's oldest and largest city, famous for the Sydney Opera House, a marvel of contemporary architecture, a true emblem of the city. Adelaid the city of churches. Brisbane Queensland capital bathed in sunlight and close to beautiful sandy beaches. Cairns gateway to the Great Barrier Reef, Port Douglas, Daintree National Park. Darwin the largest city in the Northern Territory. - Kakadu National Park one of the most visited sites in Australia, Kakadu park is located in the north of the country is made roughly half of France. This park is considered a natural treasure, has a wide range of animals, including mammals, birds, reptiles, fish and insects. This national park is also famous for Aborigines Kakadu who have lived here for a few thousand centuries. - Kangaroo Island, the third largest island of Australia attracts a large number of tourists every year. Famous for its beautiful beaches and its amazing wildlife, the island is home to many rare animals, including koalas, possums, black cockatoos and platypus. - Great Ocean Road a spectacular coastal road which will take you through Melbourne and the Port Campbell National park. 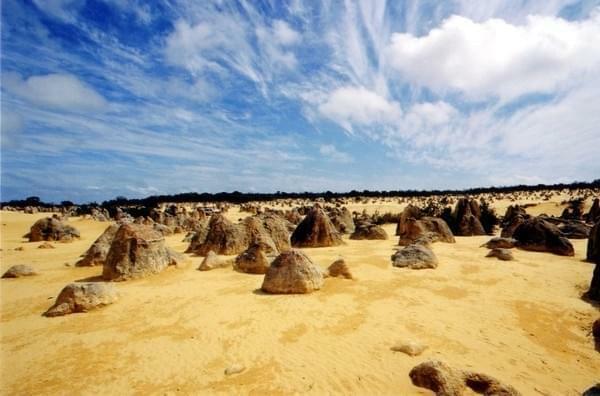 Do not miss the 12 apostles, 12 unusual and huge rock formations. - Tjuta National Park UluruKata also called Ayers Rock and The Olgas', famous for its large red rock formations planted there in the middle of nowhere. - Watarrka National Park famous mostly for Kings Canyon, a huge gap of up to 270 meters deep. - Phillip Island a visit to Phillip Island will give you the chance to meet the first four Australian species, penguins , koalas, kangaroos and fur seals. - Blue Mountains a mountainous region in New South Wales, including the Three Sisters. - Dandenong Rangespour its beautiful beaches and picturesque villages. - Nitmilukprès National Park from the town of Katherine. - Sunshine Coast and the Gold Coast to the north and south of Brisbane. - Gordon River Cruise in Tasmania . Australia is vast, therefore climate change is important, in general, the north is hot and tropical, while the south is temperate, while the center is desert. As Australia is in the southern hemisphere winter is Juinaoût, while in December to February is summer. The main companies that insure the France-Australia links are: Etihad Airways, Qatar, Emirates, Qantas Airways, Asiana Airlines, Virgin Blue, Tiger Airways, Brindabella Airlines, you can go from Paris or Nice to Melbourne, Brisbane, Sydney Perth, count about 800 euros one way for 25 flight hours, including stopovers. due to the length of travel time, some travelers from Europe opt for a stopover, usually in Singapore, Hong Kong, Dubai, Bangkok or Kuala Lumpur. Because of the great distances, it is common to travel by plane in Australia, the domestic air network is well developed, for example between major cities: MelbourneSydneyBrisbane, there are flights almost every 15 minutes during the day. All Australian international airports offer frequent connections by public transport to the city center. Shuttles are also available to take passengers to their hotels. If you go to Canberra, know that the Canberra International Airport not only welcomes that domestic flights will require you to stop in Sydney, Melbourne, Brisbane, Adelaide or Perth. Australia is crossed by two major railroads The Ghan, which runs north to south right through the heart of Australia, Darwin to Adelaide and the Indian Pacific crossing from east to west, from Sydney to Perth. This is not a transcontinental railroad at speed. This is a type of slow train. The trains are expensive, about 700 euros for example to Darwin to Adelaide, even without sleeping! with a simple reclining seat. Australia has a well-maintained system of roads and highways. Most state capitals are linked to each other by good quality roads. Some parties have two lanes, but many sections have only one way. The distances and speeds in kilometers and fuel is sold by the liter. If you venture on small roads in the interior, it is advisable to properly fill out your route and weather, bring with you a few cans of gazol, spare parts, spare tires, matches, and food and especially water. It's also a good idea to inform a person that you know your itinerary and advise him to alert authorities if you do not give news in an agreed period of time. It may be wise to also have a GPS and satellite phone. Do not forget either that in Australia, people drive on the left and an international driving license is required. Australia is expensive. Prices have skyrocketed in recent years, particularly in the tourism sector. A basic motel costs between $ 80 and $ 100 for a double room. A hotel in the center of a big city costs about $ 150 for a double room. The hotels chains in the suburbs cost about $ 60 to $ 70 a double. All visitors, except citizens of New Zealand need a tourist visa before returning to Australia. You can apply directly online with eVisitor or at an embassy or consulate of Australia. There are three time zones in Australia: East Standard Time (EST), Western Standard Time (WST) and Central Standard Time (CST). There are two-hour difference between east and west. You will not need any vaccinations before traveling to Australia.